I was going to say this month was a fairly low-shopping one because I was traveling, but then I realized that it's already been nearly a whole month since I got back from Japan. Time sure passes by quick! Things have been a a bit busy at the office in the weeks since I got back. K and I have also had a few houseguests, which, given our slight tendency towards housecleaning delinquency, resulted in needing to spend a good chunk of weekend time cleaning. In the months since that post, our cleaning skills have improved slightly, though that's added extra time to our cleaning routine, which now requires a bit more energy. I may be close to the point where I would vote to hire a service to come in once or twice a month, even if our space is quite small and a thorough cleaning still doesn't take K and I that long to do together (maybe two-and-a-half to three hours total, with each of us tackling different areas of our place, depending on how recently we last did a big clean). This month, all I shopped for was jewelry, and I bought a single piece. As I mentioned in my previous monthly budget/shopping post, I've only recently become much more conscious that now is totally not the right time to shop for most clothing. So I won't, or shouldn't be, in the market for much until I know if I'll get the go-ahead for certain plans or not. There are still a few things I could be in the market for in the next few months. First is a very small thing. I may need another pair of tights after I recently ripped a pair of Wolford Neon 40s (due entirely to my own clumsiness, not any problem with the product). There's a jagged edge on one of my desk drawers at the office, at the exact height where my knee often bumps into it while I'm working away at the computer. All my tights that I currently wear, from Wolford, Falke, and Uniqlo Heattech, have survived many encounters with this edge of the desk drawer without any real issues up until now, only a tiny snagged thread or two that doesn't show any signs of developing into a real tear. This time, though, I bumped into it much harder, at the exact angle and with the exact motion to rip right at the fabric. The damage that time was immediate and dramatic, as seen below. Second is a niche in my wardrobe that is currently unfilled. I've been mulling over wanting a pair of comfortable-enough-for-weekend-wear, non-denim pants; probably in black; probably with a skinny or straight leg, so that they can easily be tucked into boots in fall/winter; and probably in a fall/winter-friendly fabric, definitely not silk or linen. Recall that company policy changed to disallow jeans on casual Fridays at my office this past March. Now that the weather has started cooling down, and I can no longer wear jeans like I did last winter, I'm starting to miss having comfortable pants I could wear to the office on Fridays. However, I'm extremely averse to shopping for pants, it's hard to find ones that fit well through the hips and thighs, and it's also a total pain when one is short enough of leg that even some petite pants are slightly too long, at least when one is also quite lazy about going to a tailor. Chances are, I'm not going to start seriously looking for these pants for months. The only idea I have for where to look, gleaned randomly from a r/femalefashionadvice comment about comfortable outfits for air travel, is the Athleta Wander pants, but that's a half-formed idea at best. 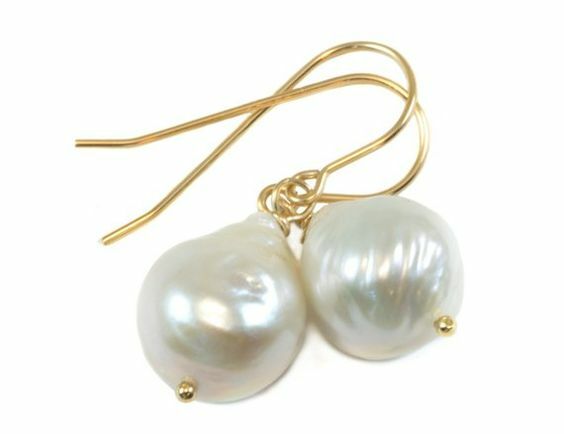 Baroque Pearl Drop Earrings with 14k solid gold wires - $88.80* - This is the second pair of earrings I've bought on the recommendation of Kathy at Feather Factor, who has excellent taste! (I previously got a pair of Nordstrom-branded cubic zirconia studs that she also recommends, which usually only get discounted during the Nordstrom Anniversary Sale.) Before deciding on this pair, I spent some time researching other baroque pearl drop earrings on Etsy, and I thought this was the best size for my tastes. I also liked that I had the option of getting them with solid gold wires. (My earlobes can get irritated by earring posts that aren't sterling silver or solid gold, but I prefer gold-tone jewelry.) These are lovely, not too heavy, and a good size to be noticeable without being too showy. I'd be happy to wear these to the office a few times a week (though probably not to court or a job interview, where I'd definitely wear small stud earrings). I'd never paid much attention to baroque pearls before, but after seeing how Alighieri uses them (i.e. in these "Beacon" earrings or the "Infernal Storm" earrings), I started to appreciate their irregular, more organic-feeling shape a bit more. I really like these, and they're a bit more in my comfort zone than a pair of larger earrings would be, as I get unusually and maybe irrationally anxious about whether heavier, more dangly earrings could possibly get caught on something and cause injury. *Indicates that price included shipping charges and sales tax. How often do you find yourself needing new tights? With tights that are equivalent to 40 or 50 denier or thicker, I don't need new ones often. I generally got at least three years worth of fairly heavy fall/winter season wear from my Uniqlo pairs before they got stretched out and started sagging, or until elastic threads started coming out of the fabric. I haven't had my Wolfords or the Falke pair long enough to fully assess long-term durability, but they've been doing great outside of my recent mishap with the Neon 40s. 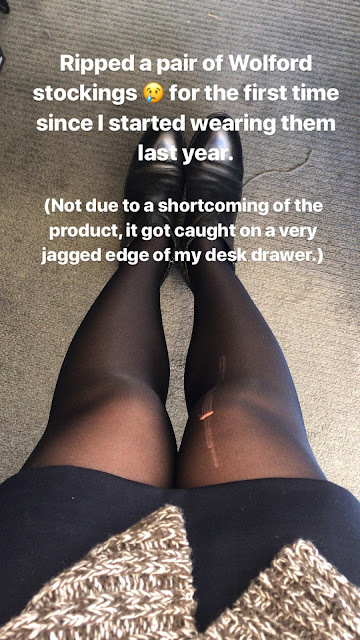 (I often snag my tights a tiny bit on the zippers of my boots or booties, or on that desk drawer edge, and it's only caused a tiny loose thread or two, but no damage more serious than that, no rips or runs, except for that one time last week.) Have you noticed the changes to J.Crew's sales strategy? I'm always taken aback by how quickly the seasons change here. Every year, it feels like I go through the process of relearning what clothing works best for each range of temperatures all over again. One day last week, I put together a desk-to-dinner outfit with my new J.Crew collarless sweater blazer (photographed here), one of my many work dresses, a light and floaty Nordstrom cashmere and silk-blend scarf (which still manages to be warm enough for me, even once winter really sets in), and some 50 denier tights (the Falke Matte 50 to be precise), only to be surprised to find that I was freezing in that outfit the entire evening. The wind cuts right through that collarless sweater blazer, even though I thought it was the right thickness for temperatures in the low 50s Fahrenheit. I still like my new sweater blazer, it clearly just isn't meant to be worn as a coat this time of year! Now that it's cooled down even more, it's definitely time for outfits that are capable of standing up to near-winter temperatures. I've had this Ellen Tracy Stadium coat for nearly three years now, after buying the 2015 version during the post-holiday sales in January 2016, and I still love it. In the years since I graduated law school, I tend to get a new wool coat about once a year. 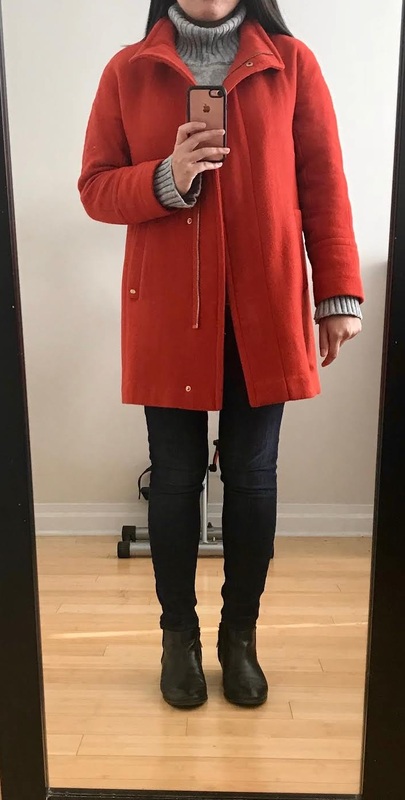 (Some of my far more frugal peers also do the same, and they comment that it's partially because it's the only particularly noticeable way to add interest to their outfits for most of the period from October through as late as April, as it's the only part of one's outfit that really gets seen while one is outdoors.) A few times, I've thought about getting the similar J.Crew Cocoon Coat in another bright color, and when I do, I usually take another look at that year's selection of Ellen Tracy Stadium coats too. I'm not sure if Nordstrom will stock it again, but they did in 2016 and 2017. My "cashmere" turtleneck sweater is from a now-defunct Taobao listing. That's not an avenue I'd recommend anyone else ever look to for any kind of shopping, by the way. One just never knows what one will get, it's the wild wild West, and there are, er, also many listings for counterfeit products on there. Any listing or seller can say absolutely anything (not that I can understand most of it, with my extremely weak Chinese reading skills, ha! ), and there's no way to verify any of it without having the item in hand. Plus, most US-based customers, myself included, shop through an agent like Superbuy, which adds additional fees. And international shipping is always a significant expense, of course. This particular unbranded sweater came from an listing that had a lot of positive reviews, as well as customer photographs of the real item, which can be helpful, but well, the idea of caveat emptor, or buyer beware, definitely still applies. Sam Edelman may have officially discontinued my beloved "Petty" booties in leather (size 6M only still available at Zappos), though they still offer it in suede. The closest new style they make now is a slightly edgier pointy-toe design called the "Walden", which I don't think would work for the office as well as the round-toe design on the Petty, at least as far as my fussy tastes and preferences for office wear are concerned! I'm totally sad about this change in their product line because I love my old booties. I actually manage to have two pairs of the "Petty", my old, worn-in ones from around December 2014 and a newer pair, made in a stiffer leather, from around December 2016. I think it's well-established that it's generally a mistake to buy backups, even of the most well-loved items, at least until the old one is well and truly worn out and unusable. It wasn't until last year that I started wearing the newer pair, I held onto them in their box for an entire year without touching them. As of now, though, both pairs are getting tons of use. I wear my newer pair to court, meetings, and other more formal occasions in fall/winter and my older, well broken-in pair the rest of the time. Have you ever bought an identical backup of a well-loved item, only to realize that it wasn't the right choice to do so? Did the backup item get any use in the end? One very small part of our recent trip to Japan was dropping by Loft (the fun Japanese stationery and home goods store, not the women's clothing retailer) no less than three times while exploring Tokyo and Kyoto. That first trip, my eyes zeroed in eagerly on their wide selection of Hobonichi Techo planners. There wasn't much real practical reason for my interest. I have absolutely no desire to use a structured, pre-printed, and dated planner, given that I've been happily using a blank notebook with dotted grid pages (from Leuchtturm) as a planner and bullet journal for nearly a year now. Yet, I was intrigued by the Hobonichis because of marketing. Some had hailed it as the best planner ever, and because I remembered reading that coverage, I was intrigued. That first time at Loft, I took a quick look, ran my hands over the pages of the samples, and found that the Tomoe River paper they use in the Hobonichis really is quite delightful, and fairly unique when compared to anything I've laid hands on before (which admittedly isn't much because I'm not typically a stationery fanatic). The paper is smooth, practically silky to the touch and quite thin, but seemingly in a good way. The planners are well known for being less bulky than many of their competitors because they use this very thin paper, but I'm told that it is still high quality, that most pens and ink generally will not bleed through. Because that paper was so lovely to skim my fingers over, I started to want to buy one of the planners, though I didn't have enough time to think it through on that first trip. I didn't necessarily plan on going to Loft again, but we did, a second and then a third time, while doing other shopping. Each time, I dwelled an unusually long time over the Hobonichi Techo display, comparing the various ones on offer (each Loft stocked practically the entire product range, including some covers) and feeling an urge to buy one (the prices were great, much better than any available if I ordered from the US, if I was ever going to buy one, it would have been best to get it in Japan). This was despite how there wasn't a single design that was likely to be a suitable product. There's only one style available in English, and its A6 size is definitely too small for me. The A5 "Cousin" size (available as either one or two volumes) is better, but it's only available in Japanese (which, to be fair, doesn't dissuade most international fans) and I still wasn't likely to get use out of a pre-dated planner. Also, the A6 and A5 ones are primarily a-page-a-day planners, which isn't useful to me, I simply don't need that much space per day, every single day. I prefer more flexibility. Also, much of the appeal of the Hobonichi-related content I'd seen on social media, which helped fuel my interest, came from the colorful pictures or pretty writing some people put in theirs. It's all lovely, but I'm hardly going to be producing that on a regular basis, or maybe ever! I don't even know how to draw! Oh, and I don't use a fountain pen (many Tomoe River paper enthusiasts are fountain pen users). I use fairly boring pens (Muji 0.38mm pens, to be exact, decent prices also on Amazon). The Leuchtturm paper is perfectly adequate for that, and I'm not sure I'd get anything special out of the experience of writing on fancy paper. So I was at Loft that second and third time, and each time I spent quite a while standing there, researching the Hobonichi product line on my phone, thinking about whether to buy something. Each time, it was a bit difficult to tear myself away. I was so very tempted to buy this thing even though I knew it wouldn't be of much use to me. I didn't end up getting one, which was the right choice, but I came very close. I'd ultimately decided that, if I were to get one, it'd be a Hobonichi Cousin and I'd need a cover. But Loft didn't stock covers for that size, so I might as well order it online directly from the company, even if there'd be a markup. I was even researching their product pages online in the days right after we returned from our trip. In the end, I decided to get a dot grid A5 notebook with Tomoe River paper instead. That's an extremely long and rambling introduction to what is ultimately a post about a fairly simple little thing I do somewhat often, even though I should know better by now. I sometimes develop a strange preoccupation with certain items that I know, with 95%-plus certainty, will not suit my needs or preferences and so probably won't get much, if any, real use. Except that I don't stop thinking about the item, I'll keep getting pulled back to admiring it and thinking about how nice or pretty it is, several times over weeks or months. It's not a thing that takes up that much of my mental energy in the end, it's just something in the back of my mind that rears its head every so often. It rarely actually results in an unwise and impractical purchase. If and when I end up giving in to temptation and ordering the item online, actually trying on the item is usually enough to remind me why it won't, in fact, work for me. So I usually send it back. Still, I'll sometimes keep going back to window-shopping for the item, even, sometimes, when I've returned it before. Please follow the link below to read about some of the fashion-related items that have had such a hold over me, and the thought process behind each. via. I did not clerk in this courthouse. A recommendation for people who enjoy the Refinery29 Money Diaries concept: Glamour Magazine's Youtube channel puts out some very interesting money-related content. Their first video, from April, about "How One Woman Spends her $95,000 Salary", made a bit of a splash and may have gone a little viral, but they seem to have flown more under the radar since then. As for how the "Money Tours" (and the similar "Honest Accounts") differ from Money Diaries? It's an (anonymized) video interview. The format is somewhat similar, starting with monthly numbers, including paychecks and recurring bills, but generally also adding more information about current savings. Their format is a bit more flexible. Instead of focusing on one week only, many people go through a set of (redacted) credit card statements for a month and explain the bigger or recurring charges. They sometimes also discuss a random-ish sample of some of the person's larger purchases from the past, things like furniture or sports equipment. I've been enjoying these videos a lot! Separately, I've long wanted to go back and revisit how I approached spending during my clerkship year. As I've often mentioned, clerking requires a significant pay cut, at least if one was otherwise going to be working in biglaw. Measuring the opportunity cost of taking a clerkship would likely result in a shockingly large number, between lost income for that year, extra interest accrued on student loans due to being unable to refinance, and possibly a lost year-end bonus as well, due to the timing of leaving and returning to one's firm. I haven't yet calculated that number for myself, but may do so in a future post. Yet, I'd go back and clerk all over again again. Heck, I'm even sometimes tempted to do a second one, but financial realities, and how much less practical and useful it likely is as a career move for an attorney further along in their career, mean that it will probably never happen. Clerking a first time was an incredible privilege that I'm grateful for, and it likely was necessary to place me in my current, absolutely wonderful job. Clerking a second time would likely be... irresponsible, all things considered, especially given that it likely wouldn't add much to my career prospects. Recent events, including with Kozinski and some of the smaller news items surrounding the confirmation, have really forced me to think about the institution of clerkship hiring (diversity is, let's just say, not a strong point) and the role of clerkships. In order to fully analyze some of the other questions on my mind, it's important to get an accurate sense of the "cost of clerking", and whether it's a financial choice that is equally accessible to all who are qualified (it isn't). To the extent that it is a bit of an elitist institution, that has implications for diversity in the profession, as clerkships may be a necessary (though not sufficient) prerequisite for certain jobs. Cash Savings: $15,000, an emergency fund accumulated during my first year in biglaw, I never touched this until my accident. 401(k): ~$11,500, accumulated during the approximately nine months that I was eligible to contribute while in biglaw (with no employer match, as is standard for us). Term clerks also can't contribute to the federal government equivalent of a 401(k). Roth IRA: ~$2,200, and I put in another $2,000 during my clerkship year, but that was the only longer-term savings I could add to during that year. Total Salary: ~$83,500/year, as a JSP-12. Link is to a current-year PDF for the NYC metro area. They get a tiny cost of living increase most years, so the current number is a little higher. Paycheck (BiWeekly): $2039.50. For the two "three paycheck" months a year, I usually put the third paycheck entirely into savings or student loans. My Share of Rent and Public Transit Cards: ~$2250/month total (numbers combined to protect my anonymity). Rent: K and I stayed in the same apartment from when I was in biglaw. Given the location of our jobs and the start and end dates of our lease and for my clerkship and prior and subsequent jobs, moving out of NYC solely for the clerkship was never a realistic option. As I sheepishly mention somewhat often, we feel like we really splurge on rent, and that's worth it to us. So while I was clerking, that was also a shockingly large percentage of my take-home pay. Student Loans: ~$445/month minimum payments. I occasionally put in more, but not in amounts large enough to make much of a dent. The bulk of my loans, borrowed directly from the Federal Government, were on income-based repayment ("IBR") for a monthly minimum payment of ~$220 dollars/month. ~$225/month represented the actual 10-year repayment minimum payments associated with my other tiny (and lower-interest, 5% as opposed to ~7%) loans borrowed from my undergraduate school and a Perkins Loan from law school. These loans couldn't be put on IBR as easily. Utilities: ~$70/month on average for my half. Water and heat are included in our rent, but we pay for electricity, including to run A/C in the summer. Numbers vary greatly throughout the year. Internet: ~$32/month for my half. Subscriptions: ~$25/month on average. I pay for Netflix for my mom, sister, and I. I also split Amazon Prime and Spotify Family expenses with my sister. * One thing I learned while clerking: People and their significant others end up needing to make eclectic, seemingly impossible, and unsustainable sacrifices in terms of commuting and where to live, in order to accommodate clerkship locations (which are highly inflexible). I spent more than 4 hours a day commuting in total and didn't even have the toughest commute out there. (People who drive, even if it's for significantly less time, definitely have it harder.) When one wants to clerk, you go where you're able to get one. Only the rare true superstars among us generally have the luxury of only applying in one city or one location and knowing they'll definitely find one on the schedule they want. That left me with ~$1252 to spend each month, and I'd reliably spend it all (including, sometimes, on a very small extra student loan payment). Technically I was living "paycheck to paycheck" during this time, and with no significant contributions of any kind to longer-term savings, it may have been less sustainable than many other "paycheck to paycheck" situations. It was such a short time in my career however, that... I wasn't really worried about the sustainability of my finances at the time. To be able to approach it that way is an incredible luxury and privilege, which I'm so grateful for. Oh, and because the student loan payments obviously weren't enough to keep up with the interest that was accruing (at a rate of ~$990/month), my total balance increased while I was clerking, undoing pretty much all of the repayment work I did while in biglaw the previous year. Please follow the link below for a tour of some of my typical spending choices during a typical month of my clerkship year! I took all my credit card statements from a random month, April 2017, and got the numbers from there. Tara Westover's Educated (affiliate link) is an extraordinary book. Immediately upon finishing it late one night last week, I was absolutely desperate to talk about it and the larger conversation surrounding it, including certain public responses from some of her family members. I was determined to convince as many of my friends as possible to read it so that they could discuss and dissect it with me and share in the emotionally harrowing experience of reading it. Looking at the timeline, Westover must have started writing shortly (certainly within a year or so at most) after the last of some difficult and traumatizing events, only the latest in a long string of highly dysfunctional things that happened in her family. She has a talent for vivid, visceral writing, taking us back to what she felt as a child and then a young adult who'd spent her entire life believing certain things, only to discover, much later on and through great effort, that many of them were not true. She witnesses so many dangerous situations and injuries, both her own and suffered by several people in her family. There were so many times when I was scared that someone was going to die because of her parents' negligence and recurring refusal to involve medical professionals, though that never turned out to be the case. Quite frankly, that may be a near miracle, as her father had a habit of encouraging his children to do construction work or operate heavy machinery without training or observing safety requirements. In part because of how little time appears to have elapsed since many of the events in the book, Westover's story sometimes feels like one that is very much "still in progress", one in which many of the people involved (Westover herself included) may still be in the process of trying to understand and deal with things. (This long-form essay is a fairly good take on this issue, I thought.) Reading Educated was a frustrating experience sometimes, both Westover and certain people in her family make decisions that seem so likely to turn out badly. It's the first time I've ever been so desperate to talk about a book right away. It's also the first time that, though the text itself was not too dense for me to read as an ebook, I still wanted to eventually buy a hard copy, so that I could go back to it and potentially get more out of it that way. To me, this book contains multitudes. On the one hand, it is what it first appears to be marketed as, a story about growing up with a father who identified as a "Mormon survivalist". (Some skeptics on Goodreads and Amazon say, essentially, that her family wasn't fundamentalist Mormon enough or off-the-grid survivalist enough for them to believe her story, or to think it "special". I think that's generally a wrongheaded view.) Yet, as Tara herself takes pains to note, both in the book itself and in any interview where the topic comes up, any critiques in the book are not about the church. Neither the church, nor even her father's anti-government (she didn't have a birth certificate until she was nine), anti-medical establishment, and survivalist tendencies (and there was a lot of all of those things going on in ways that could and did cause harm to his children) fully account for all that happens. 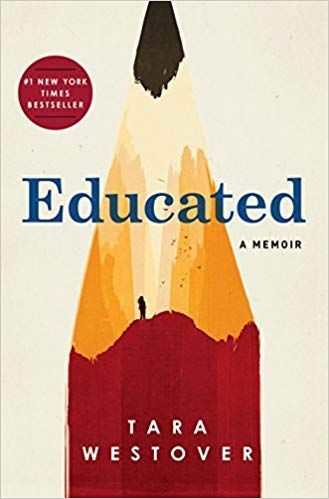 President Obama's brief but glowing recommendation of Educated captures something important and remarkable about all this, Westover writes with an almost impossible empathy and love for a complicated (to say the least) father and family, and their complicated world. The primary theme, and how Westover characterizes the book in interviews, is that it is about how an education, broadly defined (and including aspects of an informal education that she credits her parents with), made her who she is and helped her ultimately break free of what was abusive and dysfunctional in her upbringing. It also allowed her to accomplish some truly extraordinary things: She had no formal schooling (nor any kind of regular homeschooling with any kind of consistent schedule) until, at around age 17, she was able to score a 28 on the ACT and matriculate at Brigham Young University. (As she recalls, she initially didn't know how to go to school, what reading assignments in a syllabus meant, how to take exams, what the Holocaust was, and what the Civil Rights Movement was.) It was a long and hard-fought process, to eventually win a Gates Scholarship to Cambridge and earn a history PhD. Inevitably, Educated does, like any memoir about something both controversial and quite recent (and involving people who are very much alive, who use computers and the internet, and have their own fresh memories of the events depicted), implicate questions about memory and the sometimes different perceptions of past trauma by other people who were there to witness it, or who participated in it. * To that extent, I find it to be an extremely timely book. Please follow the link below if you're interested in reading the rest of my many, many thoughts on this book. 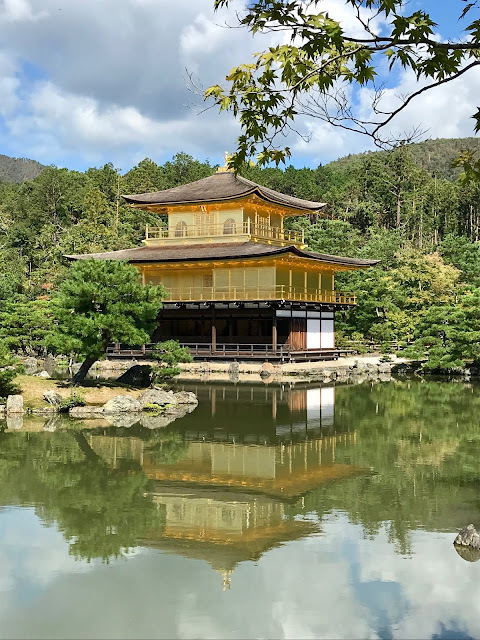 Kinkakuji in Kyoto; You can't tell, but it was actually as crowded as a NYC subway platform during rush hour all around me in the designated photo-taking area where I was taking this! We had a wonderful time on our recent trip to Taiwan and Japan! K and I took off for a little more than two weeks total, with an extra two days added thanks to Typhoon Trami. We were in Taipei to visit my family for around three days, Tokyo for about five days, and the Kyoto and Osaka area for what turned out to be closer to nine days with the storm delay. Before I get started, a quick confession: Because we had family to show us around and pick restaurants in Taipei and close friends in Tokyo to help do the same, I have less in the way of practical suggestions for those places! Chia Te to buy pineapple cakes for gifts, as they're the best of the bakeries I've tried. It's normally not too busy at random times on weekday mornings. This year, though, the line was way too long. Apparently, because it was almost mid-Autumn festival, the store had been really busy at all hours for quite some time (this was even discussed in a segment on the local news! ), even though I don't think they make traditional moon cakes. They sell Chia Te pineapple cakes at many 7-11s though. We felt a little silly when we saw them at the 7-11 near our hotel after we'd already bought something else for our friends in Tokyo. Din Tai Fung - it's so good! I always make a point to drop by when I'm in Taipei. The lines can be daunting, but I think it's worth it. (Their soup dumplings have very delicate skins and consistently perfect proportions. It's a solid step above the best I've had here in NYC.) I tend to stick to the branch near Yongkang street (a well-oiled machine, they're quite accurate with estimated wait times, which can reach a peak of 120 minutes, but usually it maxes out at 90), which means we can browse in the neighborhood (lots of souvenir shops and restaurants!) while we wait our turn. Night markets are a must-do, of course. K and I have been to Raohe and Shilin together, and we want to branch out more next time. When I was younger and visiting with family, we used to go to Shida, and that was also fun. Taking the Maokong Gondola to visit the teahouses in Maokong makes for a nice change of pace from the rest of the city. They do shut down the gondola quite often due to weather conditions, however! Japan was a completely new destination for K. I'd been once before, but that trip was so brief that I didn't see much. One thing we noticed about both Tokyo and Kyoto: touring both cities requires so. much. walking. This is despite extremely robust public transit systems. (In particular, the Tokyo subway system, with JR trains added, boggles the mind in its complexity when compared with any other I've ever used.) Keep in mind that we're NYC dwellers, so we were already accustomed to walking a lot, almost every day. It was a bit of a shock! Our feet were sore every evening, even towards the end of our trip, when you'd think that we'd have gotten used to it. Packing-wise, I hadn't expected that I'd need to wear sneakers every day in Japan. The Japan-Guide website gives excellent overviews of basically every tourist site we could think of. There are a good handful of places that are only open on limited days, or require advance bookings, so doing a fair bit of research when mapping out a general itinerary is definitely recommended. Be sure to plan out whether to get a pocket wifi or local sim card beforehand, and some advance booking may be required. We used JapanWifiBuddy, but I didn't do enough research to know if there were better deals available. Definitely install the HyperDia app on your phone (may require a licensing fee after 30 days, but it's initially free to download and use) to map out train and public transit routes throughout Japan. Google Maps will not be enough for that purpose. Don Quijote or "Donki", a large discount store that sells absolutely everything, is awesome! People recommend buying Japanese snacks (including special KitKat flavors) there to bring home as gifts. You'll also be able to do all your Japanese cosmetic and skincare shopping there. They also sell groceries, clothes, designer luggage and even some handbags (including some well-priced Longchamp totes in the Dotonbori branch in Osaka)... Literally everything! Definitely carry a coin purse. I'd accumulated nearly $15 USD in coins just in my first two or three days. We were also able to use credit cards in a lot of places, by the way, Japan isn't as cash-reliant a society as some travel guides imply. Some places were American Express only, no Visa. One thing I hadn't realized about Tokyo hotels was that some rooms that technically sleep two (particularly at hotels that likely see many business travelers) are so small that we would actually have been happy to pay more for a slightly bigger room. (Think of a room where one could almost touch every wall while sitting or standing on the bed, or there wasn't enough open floor space anywhere to open up a medium sized suitcase fully, so that both sides of the bag could lay flat on the ground.) Never before had K and I ever been particularly fussed about space in hotel rooms, even in Hong Kong where rooms are quite small (but not this small!). Not a big deal in the end, but something we would take into account next time. Food in Japan is generally excellent, regardless of price. Famously, even the convenience store food* is delicious and varied, and it is no sad thing to turn to 7-11, Lawson, or Family Mart for breakfast several days in a row. (See, for example, this video by Strictly Dumpling, one of my favorite travel and food Youtubers. The convenience stores in Taiwan are also great, but the ones in Japan really take the cake!) We had some absolutely delicious meals that were quite affordable (including conveyor belt sushi and yakitori) but also splurged on some fancy meals where one could see the quality of ingredients, the skill of the chefs, and how that justified the cost (including lunch at the ANA Intercontinental's teppanyaki restaurant). At the fancier restaurants, the prices can jump up dramatically for dinner, so trying to get a lunch reservation may be best. *In terms of food and ingredient quality in Japan, I may still be thinking wistfully of the packaged hardboiled eggs from 7-11 I had for breakfast the morning we went to the airport. To get the same depth of flavor from eggs here in the US, I think I may have to go through some trial and error with buying the fanciest, most humanely-raised free-range organic eggs ever. We had so much fun in Japan that, immediately after our trip, I was already half-making plans for a next one, despite our limited opportunities and vacation time for taking longer trips (once a year, if we're lucky), and how there are so many other places in the world that we also still want to see. Things I may want to do next time include: Staying at a ryokan for a night, probably in Hakone; going to Kamakura and Nikko as part of a trip to Tokyo; and spending more time in Osaka. And that's just the things that occur to me immediately, without any extra research! It'll probably be at least a few years before we can concretely think about taking another trip to Japan, though. Please follow the link below for more photos from Kyoto and Nara, and more detailed travel tips for the Kyoto area! I had tons of fun on my recent trip to Taiwan and Japan! Although I'd been to Japan before, it was only for a few days, so it was great to have lots more time to explore this time around. I had also never previously been to Kyoto before. I'll write in more detail about the trip later on. We encountered some slight travel delays getting home because of Typhoon Trami, as Kansai International Airport was closed (mostly in an abundance of caution and to prevent travelers from getting stranded) on our scheduled departure date. But I'm back now, and the jet lag hasn't been too bad! This month wasn't too exciting on the shopping front, with mostly secondhand purchases that I made before I left for my trip. K and I did end up needing to do some unexpected shopping while we were in Japan, though I consider clothing purchases made solely because of the needs or issues that arose during a trip to be part of my travel budget rather than my shopping budget, so I won't list them here. It was all boring/practical items anyway, mostly socks and underthings (which I don't typically document), and all from Uniqlo. It was the first time K had ever shopped there! As for what I'm expecting from the next few months? 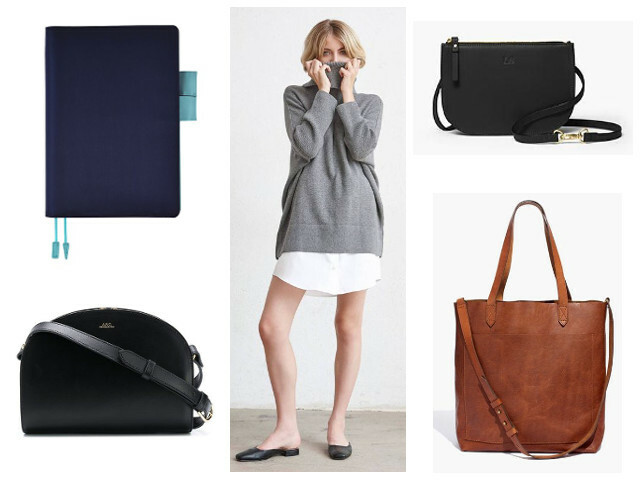 I'm really hoping I won't be buying much in the way of clothing or shoes for the rest of this year, except for maybe one really great and luxurious, slightly slouchy or oversized sweater, as described in my most recent "shopping wishlist" post. For the past few months, my savings have been ticking up steadily, right on schedule to facilitate my plans for a certain elective procedure, and I think it's finally starting to hit me that, hey, the way that clothes fit and look on me could change dramatically very soon - maybe it's best not to shop for new clothes? (It's taken a surprisingly long while for that idea to fully settle in.) As for shoes, all my boots and booties are in excellent shape and ready for at least one more winter, probably more, so I'm not expecting any purchases in that area either. I still am regularly tempted by jewelry, though. One brand that's new to me and that I discovered through a targeted Instagram ad is J. Hannah, a Los Angeles-based brand that makes a few rings that appeal to my current interest in "weighty" gold jewelry, especially their "Form" rings. Oh, and Farfetch is currently stocking a wider range of Alighieri necklaces than usual. (From all my browsing for Alighieri jewelry in recent months, Farfetch generally seem to offer the best combination of price, shipping cost, and Ebates or other cash-back rates). Their selection includes several designs I've been interested in since I first learned about the brand, including the wax seal-looking "Deceptive North Star" and "L'Infinito", and the wonderfully organic and irregular "The Odyssey" pendant on a longer chain (some listings for that one have it on a short chain that I don't think suits it as well). The prices on all the jewelry items I've been admiring should keep them safely in the "window shopping only" and "admire, but not buy" categories though, at least in the near future. J.Crew Juliette Collarless Sweater Blazer, heather gray - $88.80 - Whatever else one might think about J.Crew's quality issues and questionable business strategy decisions in recent years, they make some awesome sweater blazers. 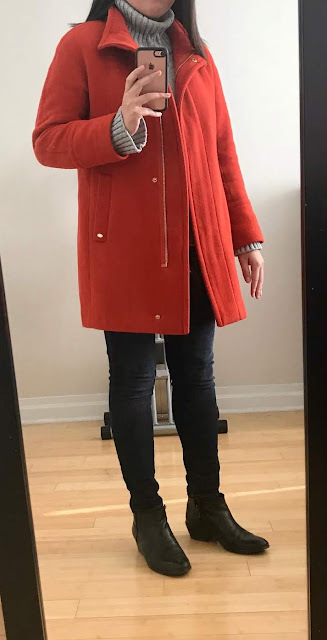 Both the "Sophie" open sweater blazer design and this newer collarless design were ones that I ordered just to try, but that I was sure I wouldn't keep because I already had plenty of other sweaters that filled the same general niche, but in the end I couldn't resist either. I took outfit photographs with this Juliette sweater blazer here and here. J.Crew Presentation Dress, black - $32.33* - The rest of my purchases this month were both on the secondhand market. 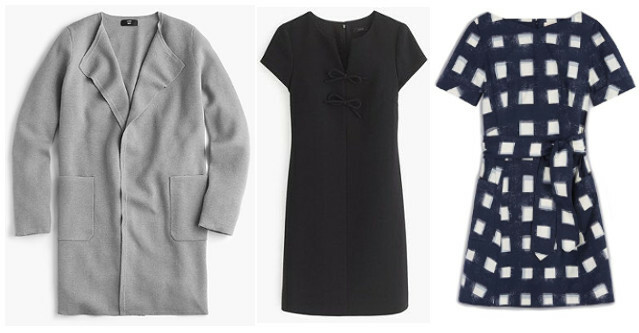 I bought the blue version of this J.Crew Presentation Dress early last year from eBay (after previously rejecting this item when it was originally in stores and on sale around 2016), and it quickly became one of my favorite work dresses. The blue Presentation dress is always one of the first things I reach for after each laundry day. I'd been looking for the black one on eBay for a few months, but never saw it in the right size and at the right price. Finally, I saw this one while browsing ThredUp unsuccessfully for some summer clothing for my Japan trip. This one is a size 8, while the blue is a size 6. Both look about the same on me, at least around the chest and shoulders, though there's more room in the skirt on the size 8. This dress is one of those items that, on paper, shouldn't work that well. It's not a particularly flattering shape on me (it's not unflattering either, just sort of neutral), and the cap-sleeve is a bit restrictive, I can't raise my arms fully. Even so, it's still become something that I greatly enjoy wearing to work. Tory Burch Tie-Front Square Print Dress - $76.95* - This was also a product of my unsuccessfully browsing the secondhand market for clothing for my Japan trip. I got this from TheRealReal, which doesn't currently have any more of this specific dress in stock, though they always have plenty of other Tory Burch clothing in various sizes. This was a bit of an impulsive buy for me. Any TheRealReal purchase is always risky because their shipping and return shipping charges are quite expensive. I thought the print was pretty, and I was reasonably confident that it would fit me and look good. It's made out of a slightly stretchy cotton poplin, a blend of 97% cotton and 3% spandex/elastane. It's also labeled a "dry clean" item, which confuses me a bit, as I think that fabric composition should be fine if machine-washed in cold water and line-dried. I've only worn it once so far and liked it, but am a bit nervous about future wears and laundering it after because I don't know whether to comply with the care instructions label. *Indicates that shipping charges were included in the price. How was your shopping month, and how's the rest of your shopping year looking? Should I take a chance on machine-washing that Tory Burch dress? I get nervous about not following the care instructions with items that were a bit expensive for me (even if I ultimately got a good deal on the item). I also don't have much experience with machine-washing stretchy cotton-spandex blends!